For the parliamentary electorate, see Māngere (New Zealand electorate). 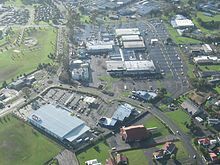 Mangere (Māori: Māngere; Māori pronunciation: [ˈmaːŋɛɾɛ]), is one of the largest suburbs in Auckland, in northern New Zealand. It is located on mainly flat land on the northeastern shore of the Manukau Harbour, to the northwest of Manukau City Centre and 15 kilometres south of the Auckland city centre. It is the location of Auckland Airport, which lies close to the harbour's edge to the south of the suburb. Mangere has two major sub-areas: Mangere Bridge and Mangere East, with Favona (in the east) sometimes counted as part of Mangere as well. The suburb is named after Māngere Mountain, one of Auckland's largest volcanic cones. The cone's name comes from the Māori phrase hau māngere, meaning "lazy winds", after the shelter the mountain provides from the prevailing westerly wind. Mangere is often described as a very multicultural area, with Europeans, Māori, Pacific Islanders and Asians living in the area, often with large families. Houses are a mixture of villas and bungalows, often located on former farms or market gardens developed by the state in the 1940s to 1960s. Mangere's most famous son is David Lange, who was the Member of Parliament for Mangere from 1977 until 1996 and Prime Minister of New Zealand. Another local personality is former heavyweight boxing champion David Tua. William Sio of the New Zealand Labour Party has been the member of Parliament for the Māngere electorate since 2008. Mangere has two marae. Makaurau Marae and its Tāmaki Makaurau meeting house are affiliated with the Waikato Tainui hapū of Ngāti Paretaua, Te Ākitai and Ngāti Te Ata. Pūkaki Marae and Te Kāhu Pokere o Tāmaki Mākaurau meeting house are affiliated with the hapū of Ngāti Pare Waiohua from Te Ākitai Waiohua, and the hapū of Te Ākitai, Ngāti Te Ata and Ngāti Paretaua from Waikato Tainui. The original Mangere Bridge was built to link Mangere with Onehunga to its north while the isthmus of Auckland reaches its narrowest point, further to the east at the former Auckland City suburb Otahuhu. Later, it provided a more direct route for traffic to and from Auckland Airport. Construction of a new bridge was the subject of one of New Zealand's longest-running industrial disputes, from 1978 until 1980. The bridge was finally completed in 1983. The Southwestern Motorway (State Highway 20), one of the two motorways running south from the isthmus, runs across the bridge and through Mangere. Passenger train Southern and Eastern Line services run along the eastern edge of Mangere, stopping at Middlemore Railway Station. Further north at Massey Road is Mangere Railway Station, closed in 2011. Frequent bus services connect Māngere Town Centre to Sylvia Park via Otahuhu Railway Station (route 32) and to Botany Town Centre via Papatoetoe Railway Station and Otara (route 31). The Mangere East Hawks rugby league club is based in Mangere at the Walter Massey Park. The Manukau Rovers RFC rugby union club is also based in Mangere and competes in the Auckland Premier Competition. The Mangere United football club is also based in Mangere and competes in the Auckland Football and NZ Football National League Competitions. ^ "Māngere-Ōtāhuhu Local Board". Auckland Council. Retrieved 11 May 2014. ^ a b "Mangere – Property". The New Zealand Herald. 7 May 2005. Retrieved 7 February 2011. ^ "Hon Aupito Su'a William Sio". New Zealand Parliament. Retrieved 9 November 2017. ^ "Southern Guide" (PDF). Auckland Transport. October 2016. Retrieved 29 March 2017. Wikimedia Commons has media related to Mangere. Photographs of Mangere held in Auckland Libraries' heritage collections.